While most of us are still slumbering in denial, many of us have awakened to a new reality after this latest war (in which I fought in Lebanon) while a few of us woke up a little earlier than the rest of us. I have taken a new look at the political situation and I suggest that all you do the same. There is a "new reality" which needs to be addressed immediately since the fate of how we live our everyday lives is at stake. This new reality that has been realized is a simple one: A large percentage of the worlds' 1.2 billion Muslims want all of us "infidels" to either convert to Islam, become subservient to Muslims or the final more easily realized option: they want us to die. The religion of Islam spread fast and furiously in the Arabian Peninsula where most Arabic speaking people (which were comprised of Jews, Christians or Pagans) lived in the 7th century C.E. The reason for this was Jihad, which generally means a "holy war." Pagans were generally killed during this first war of "Islam" (which means "Submission"), and those captured were forced to submit and convert to Islam or be killed. Jews and Christians were also largely slaughtered in Arabia, driven out of the peninsula altogether, or enslaved during this war. Mohamed's first two successors, called "Caliphs", quickly conquered the Persian Empire, and the Syrian and Egyptian regions of the Christian Byzantine Empire. By the beginning of the 8th century C.E. the forced conversion of the local people was swift and the Jews and Christians who did not convert to this brand new religion, caught in the wake of the bloody invasion of the largely Judeo-Christian Middle East, slowly moved away or settled into a subservience that bordered on slavery amidst numerous pogroms and blood libels. As time progressed, conditions for Jews and Christians progressively got worse under Muslim rule. By the end of the century south Asia had also been conquered, its' inhabitants converted by the point of the sword or killed. By the end of the 9th century C.E., the Muslim Moors had captured most of Spain only to be stopped in the Pyrenees by the Franks. By the 11th century Pope Urban the Second woke up. Islam was knocking on Catholic Europe's door. In March of 1095, a diplomat from the Byzantine Empire was sent to the Pope to beg for his help. This was no small gesture since the Catholic Church and the Byzantine Church each believed the other as not following in the true way of Christ. What brought him to the west to beg for help? The Muslims had conquered most of the Byzantine Empire's eastern provinces and were now approaching their very own capital city: Constantinople (today called Istanbul, in Turkey) considered part of Europe itself. Hence the Crusades were launched, probably not really to capture the Holy Land (Israel), but to defend Europe from succumbing to the same fate as the Middle East: Islamitization. 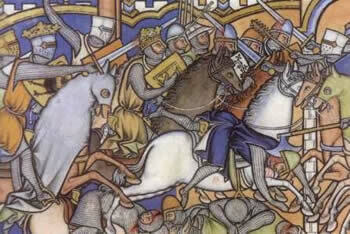 The Crusades lasted about 500 years throughout various wars, between many different kingdoms, religious orders, empires and peoples, but the fuel to the fire that we call the Crusades and the Muslims call Jihad is simple: They were merely holy wars between the Christian and Muslim world, one giant war between civilizations. In 1479 the Europeans regained Spain, but by 1529, the Muslim Ottomans were sweeping through Hungary and Austria. By 1683, the border between Christian and Muslim states was inside what is today Poland and Austria. It was only after the Muslims were ready to tear down the walls of Vienna, did the Europeans unite in a "Holy League" to defeat the Ottomans and beat them back to south-eastern Europe in what is today, Kosovo, Kazakhstan, Chechnya, Bulgaria, Albania and other European states, today inhabited by a majority of Muslims. As Europe rose out of the Dark Ages, the reformation, renaissance and industrial revolution took hold, and the last great Muslim Empire, the Ottoman Empire, drifted into its own dark age of corruption and stagnation, being nicknamed "the Sick Man of Europe". As European technology, philosophy, nationalism and economy grew by leaps and bounds, the Muslim world, once the leaders in philosophy, science, medicine and poetry, turned inward living simple lives tending their flocks, farms and trading their age old goods and materials. As Europeans looked toward science, exploration and discovery, the Muslim society seemed content in their own world. This silence was broken in 1914 with the onset of WWI, where these civilizations clashed once again. By the end of WWI the Ottoman Empire was almost completely destroyed by the western-colonial powers of France and Britain. Much of the Muslim world was now in the hands of Christians, and suddenly Muslims woke up to a global view in direct opposition to their own. Theirs is that the Muslim, and only the Muslim, is a true believer in the one God, Allah, and because of his ultimate submission to God's will he would become God's friend, as the non-believers were God's enemies, devils and sub-humans (Sheikh Muhammad Sayyed Tantawi, the highest-ranking cleric in Sunni Muslim society recently called the Jews "the enemies of Allah, descendants of apes and pigs"). The British and the French then proceeded to carve up the Middle East into modern nation-states, taking these feudal societies and different religious sects and throwing them together, trying to use them as puppets on the world stage to protect their own interests in the region. Tyrants were installed and strongmen eventually took over who had no reason for their own existence. The colonial powers set one against the other. If anyone of their own people cried foul it was easy for them to point at the age old scapegoat, the Jew, and simply declare "I am not the oppressor, it's those Jews over there!" As long as the Europeans got their oil and kept trade and labor flowing, they could care less what was going on, believing the Muslim world was theirs to exploit. This attempt at imposing a European structure on a region with out any European values or exposure was a disaster waiting to happen, and as Muslims were exposed to western culture, its religious leaders rebelled against it. So that is where we stand today. The combination of the Muslim "man on the street" now being exposed to western culture via the various forms of media, travel and immigration, their realization that the west has grown by leaps and bounds in all areas of philosophy, technology and medicine, and their feeling of being seen by the west as inferior to the westerners, and the Muslim leadership failing to lead their people forward over the last 500 years has led to a reawakening of religious idealism in the Islamic world. Couple this with just about every political and religious leader in the Muslim society, focusing this pent up anger at Israel and the west and blaming them for all of their own frustrations is leading the world toward another clash of civilizations. The man in the street is buying these rabble rousing leaders of the Muslim countries and communities propaganda hook, line and sinker, and they have successfully morphed mainstream Muslim thinking into something that reflects the Nazi party ideology of the 1930's, deflecting the blame of all the poverty, tyranny and lack of development on the Jews in order to gain power. Mainstream Muslim thinking now believes that Israel and the western nations are arrogant, oppressive, expansionist, evil and that they are to blame for all the ills of Muslim society, and many western media outlets have bought into this line of propaganda. Mainstream Muslim thinking now believes that the time has come for another Holy War. Reactions to Danish cartoonists and the Popes recent history lesson, plus, the election of Hamas, support in Lebanon for Hezbollah which led to the destruction of much of Lebanon's infrastructure, Al Qaeda popularity spread around the world (including Europe) and the tolerance of the Taliban in past as well as Iranian & Saudi theocracies, should be proof enough to the western world that we are running out of time. This time the Muslims will not gather armies and fight head on like they did 500 years ago and before. This time they are attacking us on two fronts: First from within our own societies as can been seen today throughout Europe and the United States, and secondly Islamic countries and militias are beginning to amass dangerous conventional and nuclear weapons that can be launched from afar at our civilian populations intentionally (as in Hezbollah's recent case towards Israel) and weapons of mass destruction. They will not rest until the world is united under Islam, all the pagans dead (that means you India) and all the Jews and Christians either converted, subdued or exterminated, and these Islamists don't care how many Muslims will rise to Paradise during this "noble" cause, as long as the infidel is subdued. This is the true Islam, and if you do not believe it simply read the Arabic press or watch Al Jazerra (or translations on www.memri.org. We must awake from this slumber and mobilize against this threat before it is too late. It feels good to have my head out of the sand, even if the truth isn't so pretty.